The Bonnie and Clyde Ambush Museum in Gibsland, Louisiana, has lost its Bonnie and Clyde “death car” that was shot up in the 1967 Warren Beatty/Faye Dunaway movie. Owner Ken Holmes leased the car to the National Museum of Crime and Punishment in Washington, DC, where it will be an attraction for years to come. Holmes has found another fake death car that does interest him (there are, by his estimate, seven fake Bonnie and Clyde death cars floating around). This one was “put together right next to the real one,” making it an especially good copy. But it has no engine, which would make it useless for the annual Bonnie and Clyde massacre recreation held every year at the Gibsland massacre site. 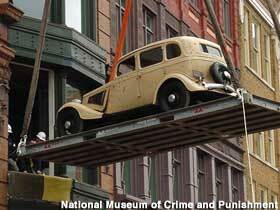 A fourth option, buying the REAL Bonnie and Clyde death car, is beyond Holmes’ budget. It’s currently on display at the Primm Valley Resort Casino in Nevada, and even the National Museum of Crime and Punishment — which has very deep pockets — couldn’t pry it loose. “And it’s pretty beat up,” added Janine Vaccarello. Downtown, just north of the Mall. From New York Ave. or Constitution Ave. turn onto 7th St. NW. The Museum is at #575, between E and F Sts.